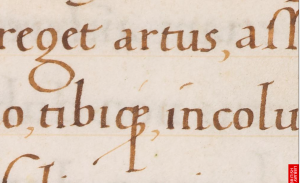 The British Library has a stunning array of manuscripts and one that has been recently digitised caught my eye because of its lively and idiosyncratic lettering; the shelf reference is BL, Add ms 19553. 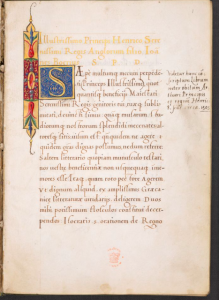 The page shown has typical Renaissance decoration – the manuscript is dated to c.1505 – with a rather restrained red, blue and green decoration on shell gold (powdered gold in gum Arabic base). It is the lively lettering, though, not the decoration, that caught my eye, particularly the exuberently free curved stroke on the letter q in the middle of the second line. This is an abbreviation and indicates that this word should be tibisque. There is wonderful control of the pen as the pen moves from the right to the left, and, with again great control, moves to the left with a slight hesitation at the finish of the stroke adding a hint of a thickening at the very end. Note also the letter g with the exaggerated lower bowl, and no little ‘ear’ to the right of the upper bowl. 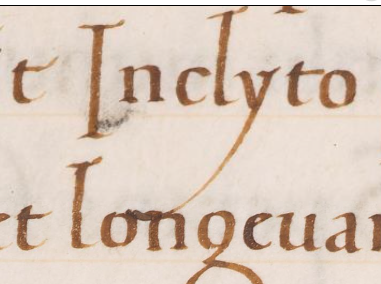 This scribe is really enjoying making these strokes! Another beautiful stroke is the one from top right to bottom left in this letter x; it is rather more successful that the slightly more wobbly stroke from top left to bottom right. Notice also the very flat pen nib angle to the strokes. Usually the nib angle for this writing style, Humanistic Minuscule, is about 30°. The flatter nib angle gives a more chunky feel to the lettering. When the letters a and e are combined as a ligature it can be a rather clumsy form. 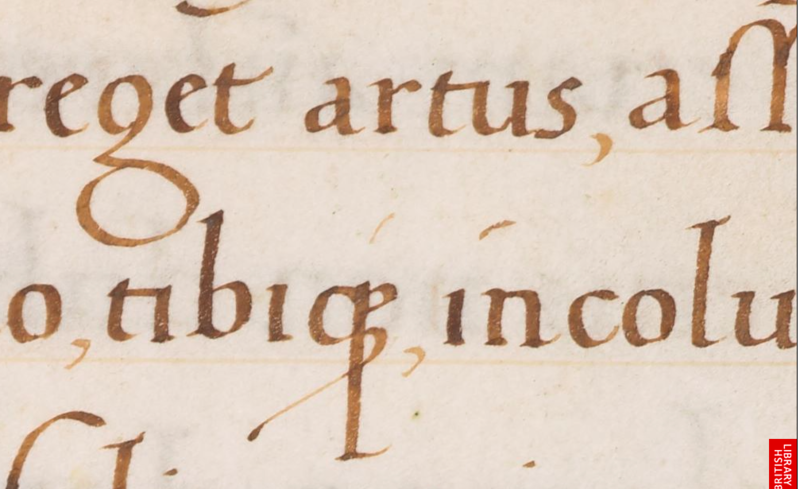 Here, though, the scribe has sloped the usual upright of the letter a and the e nestles in neatly, sharing the same stroke. Extending the ‘crossbar’ of the e and just pushing it up slightly at the end, which thickens the stroke, gives a very elegant letter-form overall. 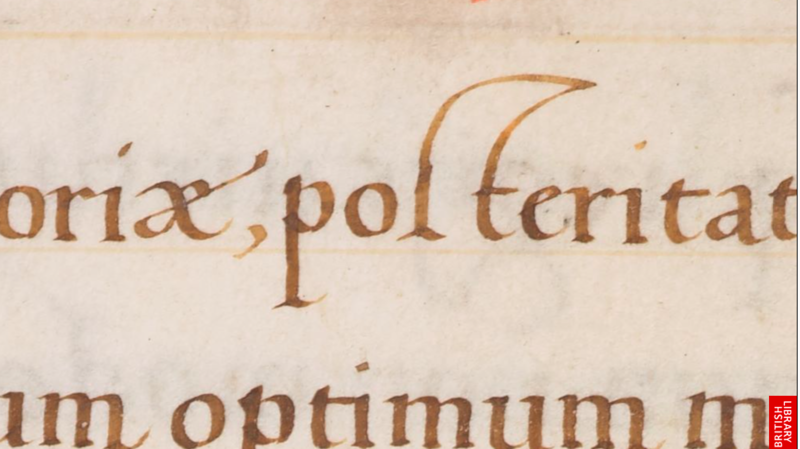 Note, too, the second thoughts the scribe has had with the long s and t in posteritate . 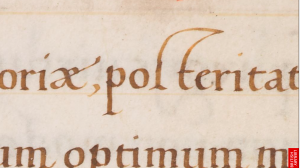 The long s started just above the line for x-height, and the letter t was written normally. Then the decision was made to extend both strokes and join them together. It’s great when watery ink like this is used as these sorts of things can be detected. The ampersand (et = and) is very graceful here, with the smaller bowl written as a complete letter o, and the lower stroke travelling to the right has a real swoosh to it. Note, too, the additional extension to the letter f written after the letter had been completed. 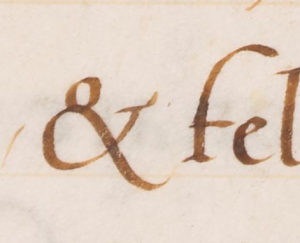 And lastly another wonderful stroke on this letter y, where the slight thickening at the end of the stroke bottom left not only collides with the letters o and n on the lines below, but the pen has also caught a little on the surface so it looks a bit messy. 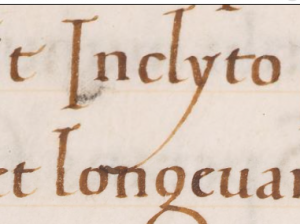 And if you want to see more of this intriguing manuscript and spot fabulous letters yourself, then click here. This entry was posted in Blog, Calligraphy and lettering, Manuscripts, Uncategorized and tagged British Library, calligraphy, lettering, manuscripts, medieval manuscripts, Renaissance, Renaissance manuscripts on 14 September 2018 by Patricia.